Hong Kong, 2018 – Apink is coming back to Hong Kong after their last year’s show to meet the Hong Kong PANDA again! 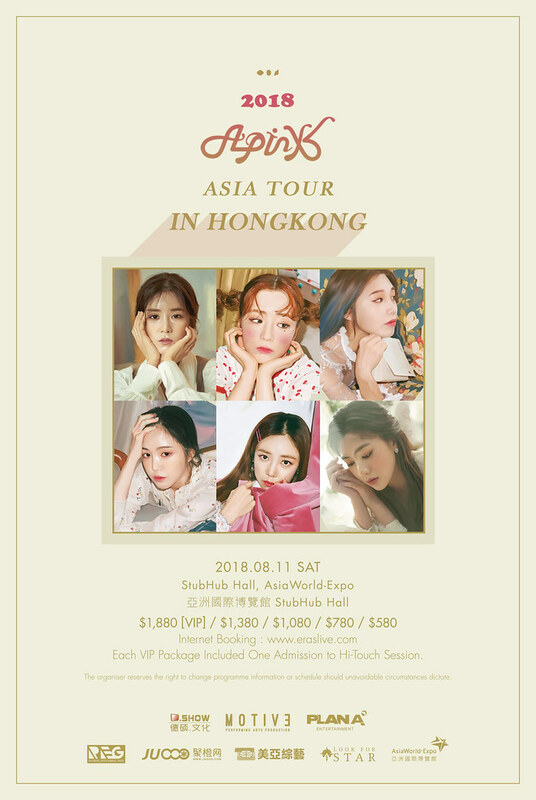 D.Show Entertainment Ltd. and Rolemodel Entertainment Group (REG) have just announced that <2018 Apink Asia Tour in Hong Kong> will be held on 11th August 2018 at StubHub Hall, AsiaWorld-Expo. Tickets will go on public sale starting from 10am Thursday, 21 June 2018 onwards via ERAS (https://www.eraslive.com). This is the 7th year of Apink since their debut and it is definitely the time to celebrate their 7th Anniversary! On 19 April, they have released a beloved special single ‘Miracle’ to thank the fans for supporting them all these years. Tickets for their 7th Anniversary Fan Meeting <Apink 5th PANDA Fan Meeting [Pink Cinema]>, which was held on 19th April in Seoul, sold out in 2-minutes’ time, which definitely signify their popularity. Apink is bringing their show to Hong Kong again this summer, Hong Kong PANDA, you will definitely come and share the joy with Apink, right? *VIP ticketholders are entitled to the Hi-Touch Session after show. Tickets go on public sale from 10am Thursday, 21 June 2018 via ERAS.